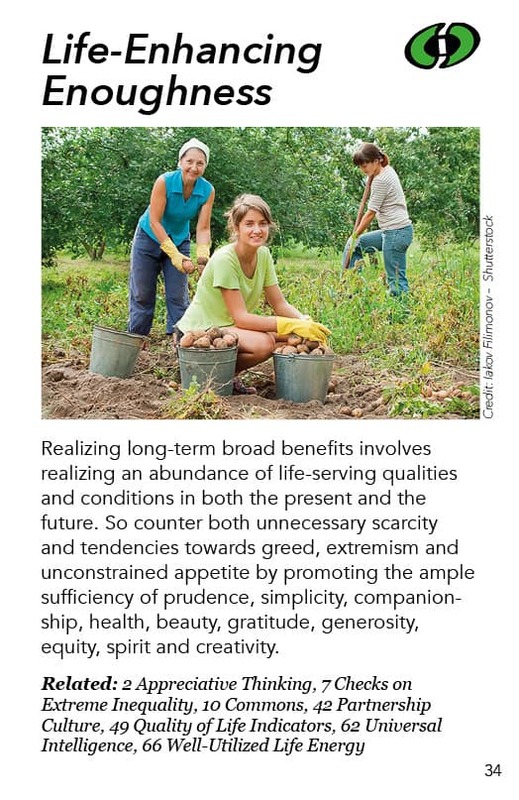 Realizing long-term broad benefits involves realizing an abundance of life-serving qualities and conditions in both the present and the future. So counter both unnecessary scarcity and tendencies towards greed, extremism and unconstrained appetite by promoting the ample sufficiency of prudence, simplicity, companionship, health, beauty, gratitude, generosity, equity, spirit and creativity. As part of generating the long-term broad benefits which constitute the essence of public wisdom – the wisdom of a whole society engaged in wise democratic self-governance – we need to think in terms of the seventh generation after us. We have inherited this profound seventh generation consideration from American indigenous cultures. We need to ask: What is the seventh generation after us going to have to work with? What will their culture be like? How is their culture going to look at how to satisfy their own needs? How will they look at how we are going about satisfying ours? This rapidly moves into questions of sustainability. Within the physical constraints of a limited world, how should we relate to physical resources in order to leave enough for the future? And in the present, how do we create our society, our economies, our politics to have enough for all the people who are here now and for the other life forms we share this planet with? We need to realize there are constraints to our consumption, obviously, because there are physical limits. However, remarkably, there is also tremendous potential abundance hidden in those constraints. There are many surveys of how happy people are with different levels of wealth and consumption. It turns out, as expected, that people who are seriously deprived – and suffering because of it – are not happy. But it also turns out that people who have lots of things tend to be attached to those things and they are also not happy. People in the middle who have enough to survive and feel more or less comfortable, yet have challenges on the physical level, find happiness in nonphysical, non-consumptive realities. They gain happiness through relationships, through beauty, through their connection to nature, through spirit, and through creativity, both individually and collectively. These sources of happiness don’t require massive inputs of energy and material, so there’s tremendous room for expansion, for growth. In most societies there are many people who have things that other people don’t have and if you create systems for sharing – a culture of sharing and gifting – suddenly there is an abundance that wasn’t apparent before when everybody was hiding their gifts, protecting their possessions and holding energy away from each other. The idea of co-creating enough and discovering enough actually can create massive abundance. 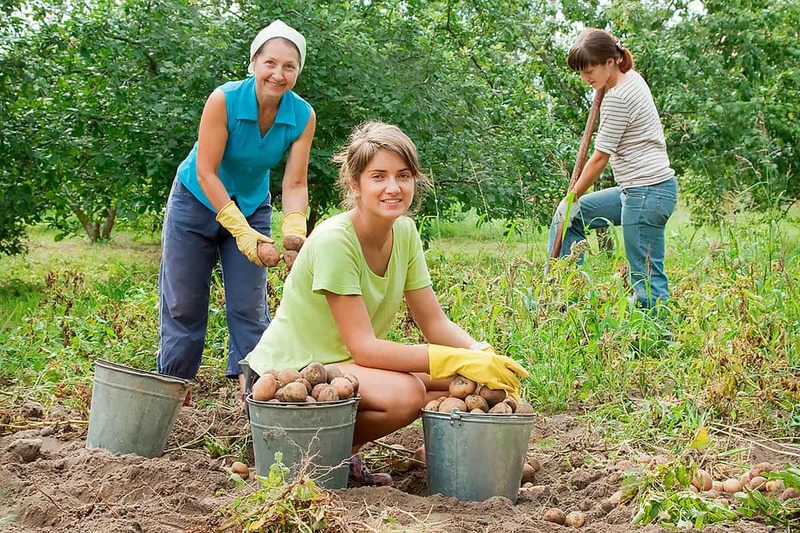 What life serving qualities do each of us possess individually and together? What life serving qualities could we find in our communities, in our societies and in our economic systems? How do we want to nurture those? What are the conditions now and in the future which will serve this sense of enoughness so that long-term broadly shared benefits are available to everybody? We don’t want to have unnecessary scarcity. There is some necessary scarcity so we have to manage that in various ways. But we don’t want unnecessary scarcity and suffering to be there. And we don’t want greed and the need to have more and more. And we don’t want extremism that is trying to push one way of looking at things, one way of doing things on everybody else. We don’t even want ourselves to feel that we have to be extreme in some way. That is damaging to our larger shared well-being that we are trying to promote. And of course unconstrained appetites – where we want more more more – that is a version of greed. This is not just an issue with material things. We can think “I want absolute freedom.” I’m sorry, but absolute freedom doesn’t exist. Freedom exists within certain constraints. If we want to be free to do things, we need to have relationships with the larger world and with each other that are healthy, that enable us to do those things without undue damage. And part of that health is accepting certain constraints. We don’t want to get into extremes, we want to nurture the sense of the middle way, the Buddhist path. And we don’t all need two cars. Three or five families can share a car. We can have good public transportation, nobody has to walk 10 miles to get water. Get rid of the extremes of wealth and poverty. Research has shown that more equitable distribution of wealth in a society creates much healthier societies overall. So a culture of abundant enoughness nurtures prudence: You want to take care of what we have and take care of the generative capacity of the living systems we live in, the social and natural systems. We want them to be able to support us and our grandchildren. So we take care of them and don’t overdo. And we thrive on simplicity: we don’t need a lot. We can live into having enough and feeling good about that. And we focus a lot on health, for enoughness serves health. Taking too much food, doing too much exercise, consuming too much enjoyable entertainment or drugs or whatever – these things are unhealthy. So we focus on what’s healthy, what’s wholesome. And we’re being grateful for that. Much of quality of life is simply being grateful. And sharing that gratitude with other people, and sharing that gratitude in a meditative sense with the larger universe: “Thank you for giving me what I have, for giving us what we have.” And because we have enough, we feel we want to give to others. The more we give to others, the more they want to give to us. In the spirit of generosity, we create a gifting economy, we are happy to give to each other and get that sweet status. Oddly enough we get status by giving to each other. And equity, we want to see more balance. We don’t want to have privileges that other people don’t have that ruin their lives. Equity is part and parcel of life-enhancing enoughness, I have enough advantages in my life, I don’t need more and more and more. I want to use what advantages I have to help other people who have less advantages to gain more. The fact that we can and are all co-creating this is such a blessing, such a blessing to do it together. So that’s part of the energy, the abundance of enoughness that comes from our pride that we are creating a lot, we are creating our lives, we are sharing, we are creating this rich enoughness. And that co-creation itself is very life serving. There are a bunch of alternative indicators to Gross Domestic Product. GDP is basically how much money is spent in the economy. And it has a lot to do with consumption. So we want to move away from that into what really makes life worth living. Let’s measure that and keep that improving. And that will naturally gravitate towards an abundance of life-enhancing enoughness. Among the approaches to quality of life indicators are The Genuine Progress Indicator and Gross National Happiness. The Simple Living movement and the gift economy involve an attitude of let us share more, let us give each other more, let us find our life value and our life meaning in supporting rich relationships with a sense of all of us being in this together – and it ends up being very potent. Required to compose you a very little word to thank you again regarding the nice tips you’ve contributed here.